Nashville, TN -- SongFood is pleased to announce a Songwriting INTENSIVE, led by Darrell Scott, to be held at the Scarritt Bennett Center in Nashville, TN from May 25-28, 2015! Get ready for 4 full days of instruction and guidance to songwriting led by Grammy Award nominee Darrell Scott. Immerse yourself in the vibrant setting and vibe that Music City (Nashville) has to offer while you discover the spiritual concepts that fire the creativity behind songs. Greenhorn or seasoned pro, this workshop is for you! It is only a few days away from celebrating 15 Years of The Nashville Sessions at the historic Ryman Auditorium! We are thrilled to announce some special additions to the lineup: Del McCoury, Ronnie McCoury, Rob McCoury, Darrell Scott, Col. Bruce Hampton, and Elizabeth Cook. This will be an exciting and wonderful night! Here is an interview with Vince about the special evening ahead. Roanoke, VA --Music Lab at Jefferson Center in Roanoke, Va. today announced the release of the There's A World of Song single, available now on iTunes, Amazon, Google Music, Shazam, and more. The single was recorded and produced inside Jefferson Center's professional recording studio and arts education hub, Music Lab. All sales proceeds benefit Jefferson Center's efforts to make music education available at the Music Lab to teens in grades 6-12 who want to learn music production, recording, performance, and all the basics of the music business. Tim O’Brien & Darrell Scott - These two stellar musicians - and longtime friends - have covered an incredible amount of ground and become mainstays of the country, American and bluegrass scene. Tim O’Brien is an incredibly talented multi-instrumentalist, singer and songwriter. The Wheeling, WV, native came to prominence with the Colorado-based bluegrass band Hot Rize, and its country-Western alter ego, Red Knuckles and the Trailblazers. The September 17 release of Memories & Moments, is the second studio album from highly regarded writer/singer/multi-instrumentalists Tim O’Brien and Darrell Scott, released on their newly formed Full Skies imprint, a compound of O’Brien’s Howdy Skies and Scott’s Full Light labels. Comprising five songs apiece from O’Brien and Scott plus one memorable collaboration in their timely “Turn Your Dirty Lights On,” along with a pair of chestnuts from Hank Williams and George Jones and a spirited rendition of the John Prine classic “Paradise,” with its author guesting on guitar and vocals, Memories & Moments is a face-to-face record by design. 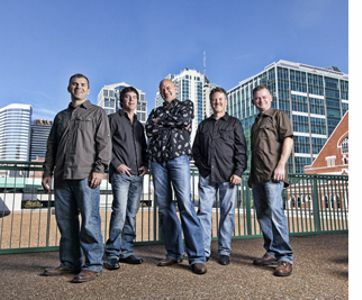 Nashville, TN -- Lonesome River Band will perform on Music City Roots on Wednesday, February 1, 2012 at 7:00 pm CT. This live concert and radio show is held at the Loveless Cafe located at 8400 Hwy 100, Nashville, TN and streamed at MusicCityRoots.com. Also performing are: Darrell Scott, Chris Jones & The Night Drivers, Darrin and Brooke Aldridge, and Special Consensus. Tickets are $10 and $5 with Student ID.